In my inbox was an e-mail from VistaPrint. The subject line said: "Bridget, we're giving you $50!" At first glance of the subject line my initial thoughts were... Yeah Right! Why would they be giving me $50 for absolutely no reason? Sure, I order things (mainly their freebies) several times a year and I'm signed up to received their e-mail updates. So, with that thought in mind I opened it and read the details. I could save $50 off ANY purchase. However, I had to pay for shipping. Then I noticed that it expires on Friday, June 10th! YIKES! If I hadn't checked my e-mail I would have missed out on a very frugal and amazing deal. That would have hurt me in more ways than one. In fact, it would have made me sick to my stomach. Since Father's Day is right around the corner I ended up purchasing two items. One for my dad and one for my husband. My dad loves wearing baseball caps and my husband loves hooded sweatshirts. So, I got them each something that will be perfect for them. A hat for my dad with a picture of his four grandkids on it. A hooded sweatshirt for my husband that is embroidered with "World's Greatest Dad!" 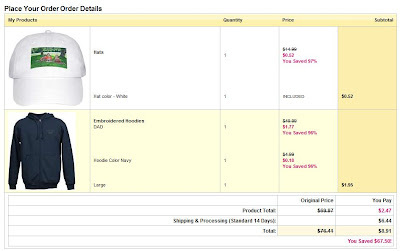 I saved $67.50 and in the end I paid $0.52 for the hat and $1.77 for the hoodie. 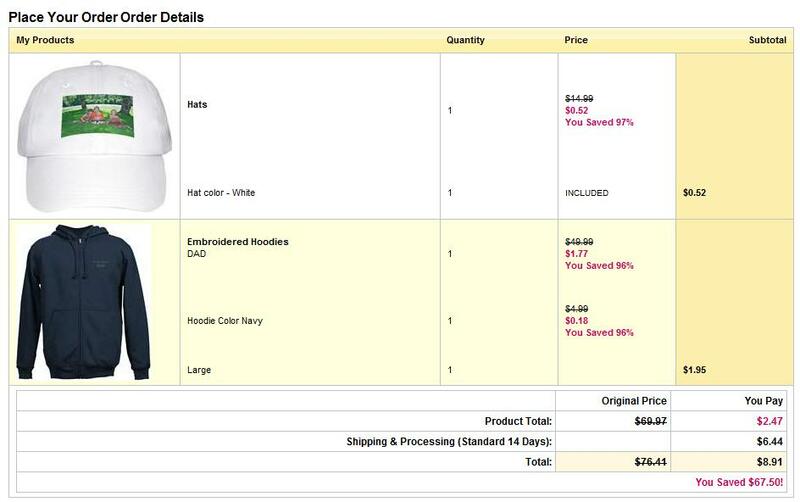 My grand total that included shipping was just $8.91. That's a savings of 97%!! 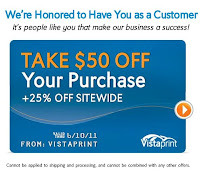 Did you get this VistaPrint offer?